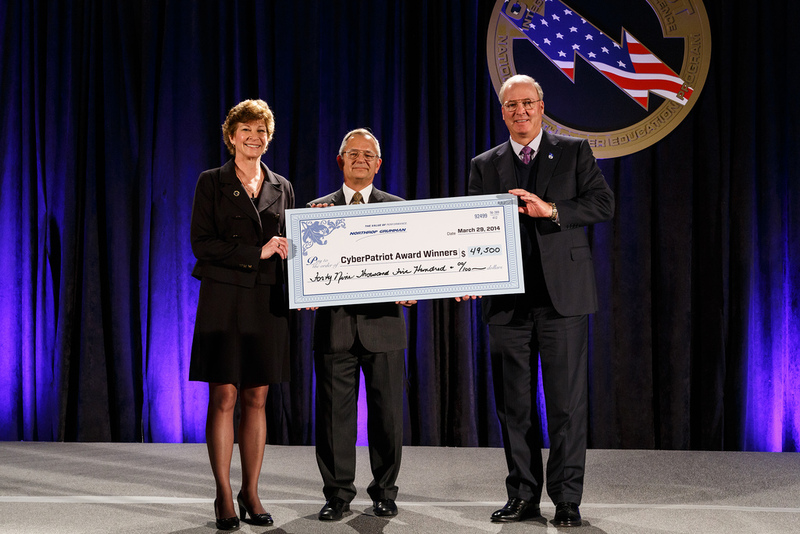 MCLEAN, Va. – March 31, 2014 – Helping tomorrow's cyber defenders further their education, Northrop Grumman Corporation (NYSE:NOC) this weekend awarded nearly $50,000 in scholarships to students on the winning teams of the CyberPatriot VI National Finals Competition. National Champion: Team "Azure," North Hollywood High School, North Hollywood, Calif.; National Champion Runner-Up: Team "V'Ger," Grissom High School, Huntsville, Ala; Third Place: Team "Sudo," Summit Technology Academy, Lee's Summit, Missouri. 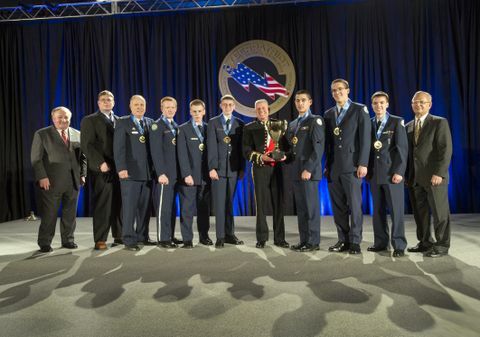 National Champion: Team "Fearsome Falcons," Clearfield High School, Clearfield, Utah (Air Force JROTC); National Champion Runner-Up: Team "Marine Raiders," Montachusett Regional Vocational Technical High School, Fitchburg, Mass. (Marine Corps JRTOC); Third Place: Team "Rodney's House," Patrick Henry High School, San Diego, Calif. (Navy JROTC). National Champion: Team "Cyber Knights," Beach Cities Cadet Squadron, San Pedro, Calif; National Champion Runner-Up: Team "Leathernecks," Marine Military Academy, Harlingen, Texas. 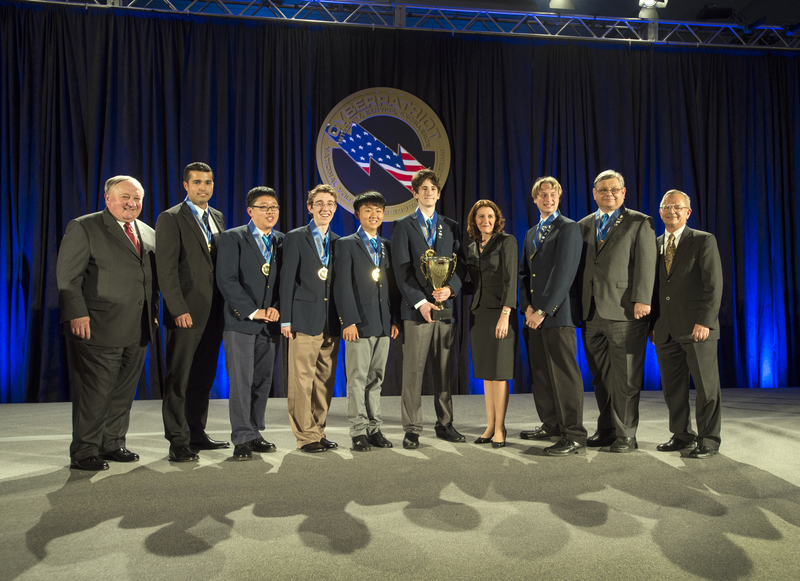 The winning competitors from the high school divisions collectively received nearly $50,000 in scholarships from Northrop Grumman. First place winners were each awarded $2,000, second place winners each received $1,500, and third place winners each got $1,000. This is the fourth year Northrop Grumman has provided these scholarship funds. "These scholarships are making the field of cybersecurity more accessible than ever before, providing opportunities to a broader range of students and thus increasing this critical talent pool," said Diane Miller, Northrop Grumman program director for CyberPatriot. "We are so proud of these students, whose hard work and dedication has earned them the prestigious title of national champions. We wish them continued success and a bright future." "CyberPatriot is generating a strong and consistent flow of students interested in STEM and cybersecurity," said Sandra Evers-Manly, vice president, Global Corporate Responsibility and president of the Northrop Grumman Foundation. 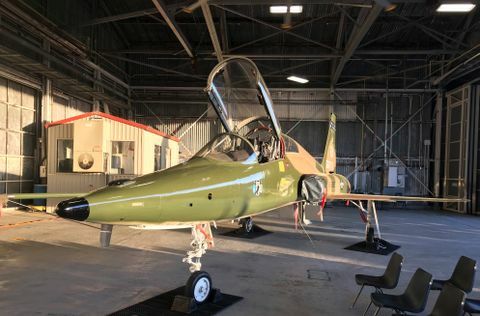 "Our partnership with the AFA is making a difference in career choices. We're now seeing a whole new generation of qualified cyber pros ready to take on the challenge of securing our digital future, a national security priority that grows more critical every year. Congratulations to everyone who participated; we look forward to even more candidates taking-on the challenge for CyberPatriot VII." This year's CyberPatriot VI National Finals Competition featured 26 high school and, for the first time, two middle-school teams from around the country who competed to defend virtual networks and mobile devices from a professional aggressor team. 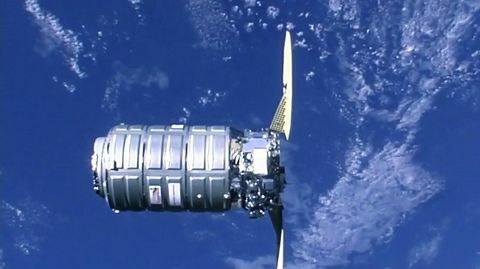 The competition drew a record 1,566 teams, a 30 percent increase over last year, representing all 50 states, the District of Columbia, Puerto Rico, Canada and U.S. Department of Defense Dependent Schools in both Europe and the Pacific. Photos from the event are available at: https://flic.kr/s/aHsjVUd4LZ . In its fourth year as presenting sponsor, the Northrop Grumman Foundation and Northrop Grumman Corporation continue to devote time, talent and resources to support this critical STEM initiative aimed at building tomorrow's cyber workforce. The foundation extended its support in 2013 through CyberPatriot VIII, funding expansion to middle schools and internationally as well launching a cyber summer camp initiative this year.